The Curtis Ballroom at The Landmark is a flexible event and meeting space that can accommodate any of your event needs. Conveniently located just 15 minutes from downtown Denver, in The Landmark Village, the Curtis Ballroom at The Landmark provides elegance in a beautiful setting. 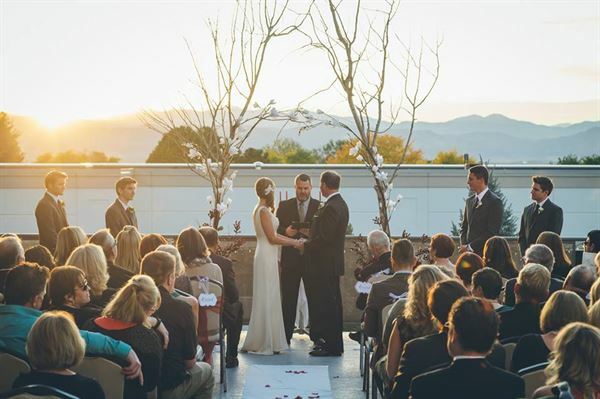 The panoramic view of the Front Range create a magical and spectacular backdrop for any special occasion. From conception to execution, our event coordinators and event staff will make sure your day is flawless. We customize menus with our in-house caterer to help create a menu perfect for your event or meeting. We also can provide all bar services specific for your event. The Curtis Ballroom at The Landmark team is committed to originality and style in creating your memorable experience. If you’re interested in hosting your ceremony here as well, we do provide both indoor and outdoor options. Our outdoor patio can accommodate up to 150 guests with beautiful views of the front range. Our inclement weather back-up would be inside the ballroom on the dance floor facing our floor to ceiling windows, which still provide the same beautiful view. We have a space that will exceed your expectations. The Curtis Ballroom at Comedy Works South offer 25,000 square feet of event space and meeting rooms: Curtis Ballroom (3rd floor) - Capacity 200 seated, 300 standing - Comedy Works South Showroom (1st floor) - 450 seated, theater style - Lila B. (1st floor) - 150 standing - H4 Room (2nd floor) - 50 seated - Howlett Room (2nd floor) - 30 seated - Lucy (2nd floor) - 300 standing --- No room rental fee for daytime corporate events, just whatever you order for food and beverage. Lila B. Lounge is an intimate gathering spot in the Denver Tech Center, where you can socialize, drink and snack in stylish comfort. Lila B. Lounge is open five nights a week-Tuesday through Saturday- and offers a killer happy hour (Tues-Fri) and live music year round (Tues-Sat). Enjoy original menu items and a full bar with a wide variety of wines, liquors, and beer. In the warmer months, sit out on our patio and soak in the Colorado sunshine. We cater to guests coming to comedy shows as well as residents of the local community. Lila B. Lounge is great for a corporate break-out space as well as an organized happy hour. Let our event staff execute the perfect event for you at our Lila B. Lounge! Lucy serves delectable, modern American dishes with a vibrant twist everyday of the week. Featuring daily specials including breakfast and lunch specials Monday thru Friday. We invite you to the warm, casual, yet elegant atmosphere of Lucy Restaurant located [above the club] at Comedy Works South. Lucy is the perfect place to rent out for events including but not limited to: fundraisers, private dining, showers, and much more. The Comedy Works South Showroom is not only used by the country’s best comics, but it is also a versatile event space that can accommodate up to 450 guests. With elevated ceilings, theater style seating and stunning decor, the venue that has hosted many world-class comics will make your event an unforgettable experience. The Showroom offers a visually-perfect stage equipped with a sound system, audio and visual equipment and lighting. Hosting your event in the Showroom is guaranteed to leave a unique and lasting impression on your guests. The H4 Room is an elegant and chic event space suitable for any occasion. The subtle and contemporary decor will go perfectly with any event theme and is the ideal place for business meetings, cocktail parties and holiday dinners of up to 50 guests seated, 70 guests standing. The H4 Room is fully equipped with state-of-the-art audio and visual capabilities to enhance all event types. The Howlett Room is visually stunning from the second you walk into the room. With a circular ceiling and bold colors, this space creates a dramatic but intimate setting for a wide variety of events. Howlett offers discreet privacy for groups of up to 26 guests, and is a popular venue for smaller parties, dinners, and business meetings.